Jenn Coffey is an award winning author and public speaker. Her works have been published in Blade Magazine, and here again in Blade Magazine, and Women and Guns Magazine. Coffey has also been featured in such publications as the Union Leader, New York Times, The Source with Ezra Levant, Reason Magazine, Knife Depot, Knife Rights, Knives 2013: The World’s Greatest Knife Book by Joel Kertzman, and the Christian Science Monitor. 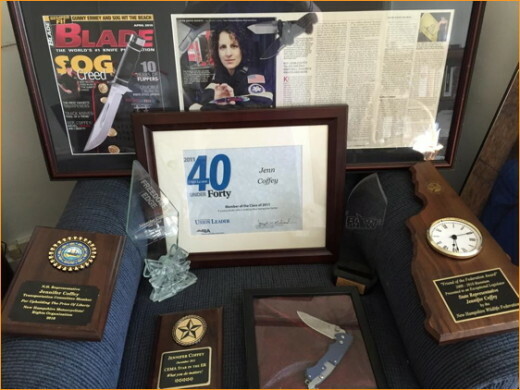 Jenn Coffey has received numerous awards, such as the Freedom’s Edge National Knife Rights Award, and The Union Leader’s “Class of 2011 – 40 Under Forty“. Jenn self-published an autobiography in 2011 entitled “Knives, Lipstick, and Liberty One Woman’s Journey“, available in soft cover and e-book on Amazon.com. 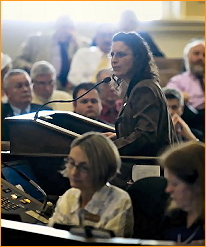 Active in the Liberty Movement since 2005, Jenn served as a New Hampshire State Representative for 4 years and was a member of the Speaker’s Transition Team, and Leadership of the House of Representatives. Formerly Coffey served at the National Director of Legislative Affairs and member of the Board of Directors for the Second Amendment Sisters, Inc.
She worked as an EMT and is known to like ocean beach walks, collecting knives, drinking coffee, and become a pitbull to those that try to further erode our liberties. She currently hosts Liberty Walk on IPM Nation Radio and co-hosts Matt Connarton Unleashed. What a powerhouse! Jennifer is truly a woman who is not afraid to stand up for what she believes in. Not afraid to get involved and not afraid to fight the fight. I consider Jennifer to be of the highest caliber. I don’t know how she finds the time to do it all. I am inspired by her passion and perseverance. A remarkable roll model for me personally and a beautiful soul. Jenn Coffey is passionate about the things that matter to her, forthright, intense, intelligent, engaging and a great communicator. Not only is Jenn Coffey an inspiration for her many New Hampshire constituents, but she has won over scores of knife enthusiasts worldwide for her efforts in championing the idea that their right to own and carry their knives when they want to and where they want to is their inalienable right. In my business, it doesn’t get much better than that. Amazing, smart and what our country needs more of! Jennifer is a top notch public speaker and author. She is organized, focused and energetic. I suspect she will rise very high, professionally, over the next few years. “Busy Bee” Jennifer is a colleague of good standing and is dependable in her responsibilities to the citizens of her district. Jennifer is truly a remarkable legislator and I recommend her with no apprehensions. I have always been very impressed with Jennifer’s knowledge and understanding of various situations in New Hampshire and the professional manner in which she went about solving problems. Jennifer is a very effective public speaker and is able to invoke passion, logic and persuasion into a succinct message. Jennifer is a great motivational speaker. Who would have ever thought that a rural NH Mother would make enough noise to be heard through the entire state of New Hampshire get herself on the ballot as a State Rep and then get elected? Only Jenn! What she’s done for the Citizens of New Hampshire is remarkable! Jenn is extremely passionate about citizens rights! She’s a staunch and stalwart ally to those seeking to protect their rights! She’s tireless when it comes to researching a position to make sure her fellow residents are represented fairly on an issue. We’ve spent many hours on the phone discussing legislative issues, and I’m not even a NH resident. That gives you an idea of her dedication to her people. I wish she lived here in MA; we could use a State Rep like Jenn here! If she feels a cause is just she won’t back down from the toughest of adversaries and will fight with all her might to support what’s right! She goes above and beyond the call of duty to “get the job done”, and I’m proud to work along side her and be her friend! Going forward… Watch her climb the political ladder… can you say Governor Coffey? Keep up the great work Jenn! Knives, like guns, are important to women. Representative Jenn Coffey’s knife rights bill sends a strong message giving freedom to honest citizens,opposing the misuse of a useful tool. 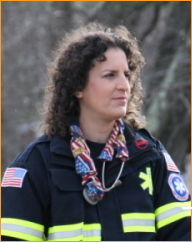 Jennifer is an asset to the NH House. When she was first elected to the House she dived right in and became a leader in various issues. I liked working with Jenn and hope to work with her again. A passionate, capable defender of personal liberty, community and family, who understands that our founding documents are the proper framework for said Liberty. When I was new to the area and trying to navigate the laws/rules regarding our School District, Jenn Coffey actually took the time to not only email me, but call me on the phone to help. Since then she has been a remarkable resource for me as well as an incredible Representative for our citizens; she advocates for the people she serves and devotes herself unselfishly to her community. I’m proud to have a stand-up person such as Jenn Coffey in our NH State House. Jenn is an brilliant and patient legislator dedicated to the principals of Liberty, Accountability and Personal Freedom. She works hard to bring a sense of the “individual” who needs protection to the machine of government and gets results. It was Jenn who taught me how to use the institutional knowledge at the State House to do research and be more effective. After her coaching for a few days I instinctively knew where to go to get information, and how to find the difference between the rumors and the facts. Jenn’s experiences gained from her fight for Knife Freedom in New Hampshire should be a model to concerned citizens across the nation. I would also recommend reading “Knives, Lipstick, and Liberty One Woman’s Journey”. Jennifer is one of the reasons I heartily believe we can save our country by having patriots like her run for office and bring about smaller government for our nation. She is an accomplished author who stands up for her convictions. No summertime soldier or sunshine patriot, but one who seeks greater peace, liberty, and prosperity all the days of the year. Jen Coffey is a solid supporter of our 2nd amendment rights and constitutional limited government. She is a promoter of individual liberty and a great asset to our NH state House of Representatives. She always makes time to address the concerns her constituents. Jenn Coffey is the most staunch supporter of our individual rights that I have ever met! She is tireless and has a true heart. Please keep her in office! Someday I’m going to grow up and be just like Jennifer Coffey! A liberty minded individual who loves her family and community enough to sacrifice her personal ambitions in order to spread the message of Life, Liberty and Justice for All. Wish there were more people like Jennifer that cared this much about NH and small business. Jenn is a true daughter of New Hampshire, standing firm like granite for the people of New Hampshire, and the values and principles that symbolize our State motto – “Live Free or Die.” Everyday Jenn represents us in Concord, is another day that the cause of liberty is well served. Jenn Coffey has done a great job in Concord and should be returned as one of the few incumbents to be returned. I had the pleasure of entering the New Hampshire House of Representatives in the same freshmen class as Jenn. While many incoming freshmen want to become a leader and seek opportunities to vocalize their leadership on every issue Jenn took the exact opposite approach. She worked hard both at the committee level and in the house body to drive, cajole and educate other members of the house on proposed legislation that expands personal freedom and personal responsibility regardless of what establishment party leaders advocated. It is this philosophical rudder that makes Jenn a compelling advocate for her constituents and gives me personal pride to have worked with her.